When first using Data Tables in Excel you may come across a situation where you feel you have done everything correctly, yet the data table is clearly wrong as all the numbers in the middle are exactly the same instead of something like the image below. This could be due to one of two reasons. First click on your F9 key. If the table updates itself it means that your calculation method is set to Automatic except Data tables. 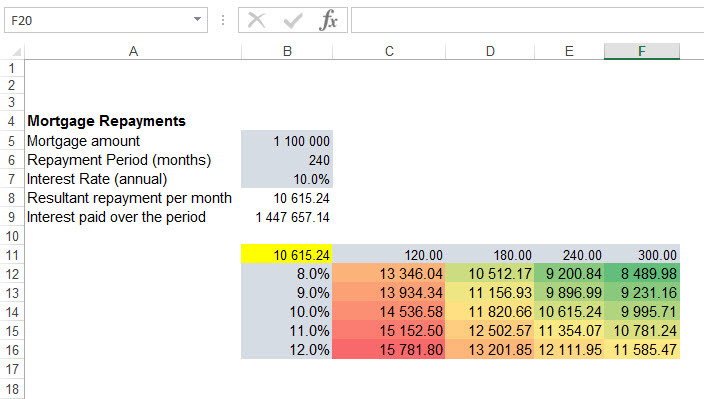 This is actually a good idea as data tables can be intensive, but if you want to see the table change all the time, click on FORMULA, then CALCULATE OPTIONS, the AUTOMATIC (as shown below). When you set up the data table it is important to make sure that you correctly assign the correct cell to the Row input cell and Column input cell. If you mix these two around, or click on the wrong cells, you will either get the same result or else nonsensical results.